This exceptional mask has been used by the male Mmwo secret society, agbogho mmwo. Helmet masks (also called agbogho monnwu or ikorodo meaning ‘maiden spirit mask’) are used during annual ‘fame of maidens’ ceremonies to honour ancestors and the ideal characteristics of young women. Found in Northern Igboland (around the cities of Onitsha and Awka), the masks are a visual representation of a number of maiden spirits (Mmwo) highlighted by fine features, elaborate hairstyles and white clay pigmentation on the face (as is the case for ancestor masks). 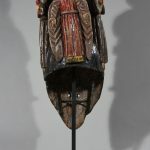 This mask is equipped with European and religious motifs. 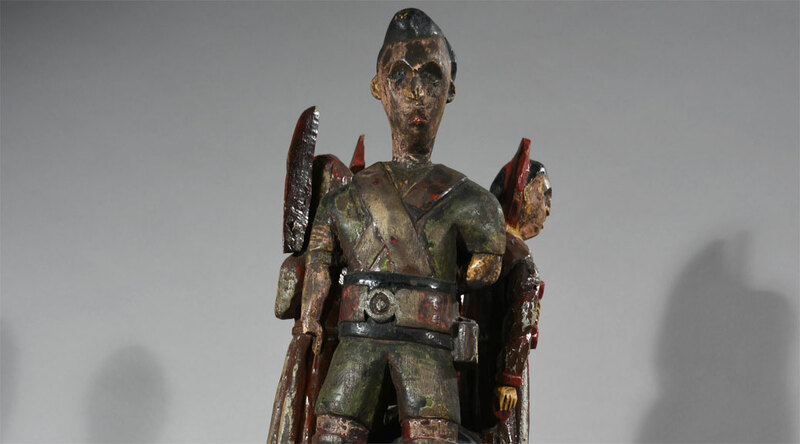 The figure on the front symbolizes a Caucasian soldier. 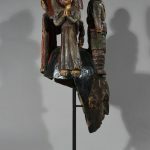 The three religious figures with the angel, the Madonna and the priest indicate that the mask wearer is Christian Catholic. Age: Est. beg – mid. 20th Century. Provenience: Belgium private collection. Collected in situ by a Belgian missionary in ca. 1960. 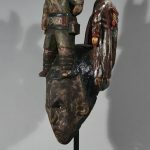 Acquired from a Brussels gallery in 2004.